Bryan Ravit is a tenacious, 32-year-old salesman who is mastering the art of the selling. For over a decade, Bryan has been doing sales the hard way, cold calling, and door-2-door. He has continuously developed and refined his skill and used it to bounce back from tough financial situations and thrive, really thrive. He is on track to make $500k this year, with most of that coming in just a 7-month window. Bryan started in sales as just a teenager (and was admittedly not very good) and has since learned how to sell to just about anyone, and anywhere. Drop him in any neighborhood in America and he will end the day several thousand dollars richer. He is as ambitious as he is inspiring, helping all types of people learn how to sell and make their own way by watching him do exactly that. This episode proves that there are many ways to make money by investing in yourself and developing skills, even when it can be extremely uncomfortable to start. 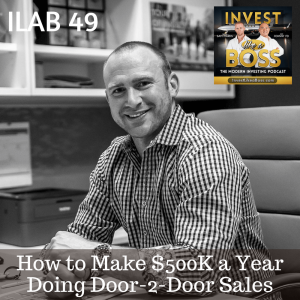 Sales, especially door-2-door have been around for 5000+ years, and it has never been easier to make big $ apply this skill than in modern day. Listen to ILAB 49 on iTunes here or subscribe on your favorite podcast app. 04:20 – What makes a good salesman?